This article is about the space cruise ship. For the street-going vessel, see Land Titanic. The Titanic flying away from Earth and the Moon in 3000 (1ACV10). The Titanic was the largest, most luxurious space cruise ship ever built (1ACV10). She resembled the classic steam ship of the same name in design with its four funnels and sharp bow, sported a casino with a bar, a buffet (including bisque, Amy's favorite), an outdoor swimming pool on the deck, a large restaurant and many other amenities and was fueled by many stokers shoveling dark matter into the fires. Propulsion was seemingly provided by one or more dark-matter reactors situated in the bowels of the ship. Unlike her unlucky namesake, the ship sported a great number of escape pods at the stern, sufficient to allow every person on board to escape in an emergency. The Titanic began her maiden voyage at the South Street Spaceport in New New York in 3000 under the command of the honorary captain Zapp Brannigan and his First Officer Kif Kroker. She was christened with none other than Leonardo DiCaprio's head. During the passage, Captain Brannigan felt the captain's itch for adventure and decided to change course right into a swarm of comets. When the course turned out to be more suicidal than initially hoped, another course change was made into a region empty of comets that was, however, filled with a black hole. The ship got caught in the pull of this interstellar gravity well and began to break up. Captain Brannigan relinquished command, to Lieutenant Kif Kroker, to allow himself to be first to leave the ship. Unlike the original Titanic, the ship was abandoned by almost all passengers before she was eventually sucked into the black hole. The only casualty was one aristocratic fembot, the Countess de la Roca. The bowels of the ship. 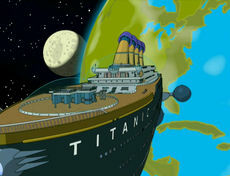 Another parody of the original Titanic is the Land Titanic (6ACV12). While looking at the directory, the plate breaks in half between the third and fourth funnels; a nod to how the ship sank in the 1997 Titanic film. This page was last edited on 5 May 2017, at 03:47.